BIRD QUARANTINE: The Maryland Secretary of Agriculture has extended emergency orders to prevent high-path avian influenza from infecting Maryland poultry flocks. The quarantine order went into effect July 1 and will remain so until at least Dec. 31, Michel Elben reports in the Carroll County Times.”This highly virulent strain of avian influenza could be an economic disaster for our largest agricultural sector if we don’t take steps to protect the birds,” said Agriculture Secretary Joe Bartenfelder in a news release. TEEN SERVICES FUNDING DELAY QUESTIONED: The leaders of the General Assembly’s two budget committees are asking for an explanation why Gov. Larry Hogan has delayed $600,000 earmarked for services to at-risk teens. The letter to the Hogan administration from Sen. Ed Kasemeyer, of the Budget and Taxation Committee, and Del. Maggie McIntosh, of the House Appropriations Committee, comes after The Daily Record reported that funding expected on July 1 for eight Youth Services Bureaus was delayed and is unlikely to be released, Bryan Sears of the Daily Record reports. Father and son: Del. 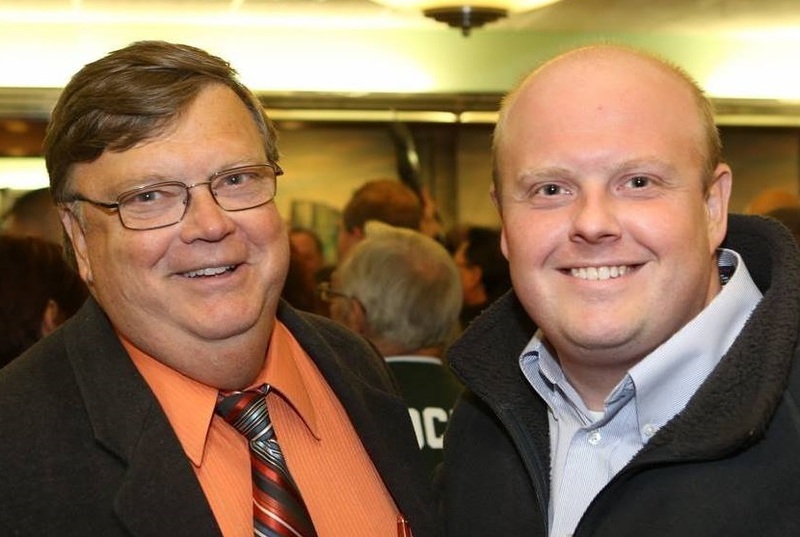 John Cluster, left, announced he was being appointed to the parole board, while son Joe Cluster, executive director of Maryland Republican Party, announced he would seek appointment of the northeast Baltimore County seat. From Joe Cluster’s Facebook page. DEL. CLUSTER TO TAKE PAROLE SEAT: Del. John Cluster Jr., a Baltimore County Republican, will resign his seat in the House of Delegates to accept an appointment to the state Parole Commission, the lawmaker said Monday. Cluster, a former county police officer who has been an outspoken proponent of strict law-and-order policies, said Gov. Larry Hogan has named him to the parole board starting Aug. 1, Michael Dresser and Pamela Wood of the Sun report. The delegate’s son, Joe Cluster, executive director of the Maryland Republican Party, announced on his Facebook page that he would seek appointment to the seat. FROSH SEEKS LAWSUIT DISMISSAL: Maryland has urged a federal judge to dismiss a civil-rights lawsuit that claims the state is unconstitutionally holding more than 200 juvenile offenders who are now adults under de facto sentences of life in prison without the possibility of parole because Maryland governors have historically not granted parole to lifers, writes Steve Lash for the Daily Record. CHAMBER OF COMMERCE FOR CANNABIS: “We want to make sure that we’re specific to Maryland,” said Darrell Carrington, executive director of the Maryland Cannabis Industry Association. Carrington described the association as the “chamber of commerce” for the state’s cannabis industry. Keeping with that role, the conference, taking place on July 13 at University of Maryland, Baltimore County’s Technology Center, is geared toward those who want to obtain licenses for cultivating and processing marijuana and for people planning on becoming patients, Anamika Roy reports for the Daily Record. CARROLL NEEDS ZONING FOR RX POT: The editorial board for the Carroll County Times writes that medical marijuana will soon be available in Maryland, and that includes Carroll County, thanks to laws passed in the state legislature in recent years. Where, exactly, it will be available remains to be seen. Knowing how controversial it is — and the need to balance availability for those with legitimate prescriptions versus fears of the community and law enforcement — we think it’s smart that municipalities and now the county are thinking about zoning changes to guide how growing, processing and dispensing facilities will fit into the community’s landscape. EYES ON DEMS, PHILADELPHIA: Center Maryland political commentator Josh Kurtz writes about what to expect at the Democratic National Convention in Philadelphia. It will likely be a far cry from what Maryland Republicans can expect in Cleveland, with more politicians schmoozing, jockeying and politicking and looking toward the Maryland governorship.